Server works very well and I do not have any problems with it. 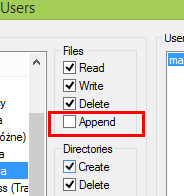 I can not find any explanation about the permission option, I mean the "Append" option. This option is only active together with the active "Write" option. Please explain its operation in connection with the "Write" option. It allows user to append data to existing files on the server. As appending data to a file also means writing to it, it requires write permissions. Used for resuming uploads.